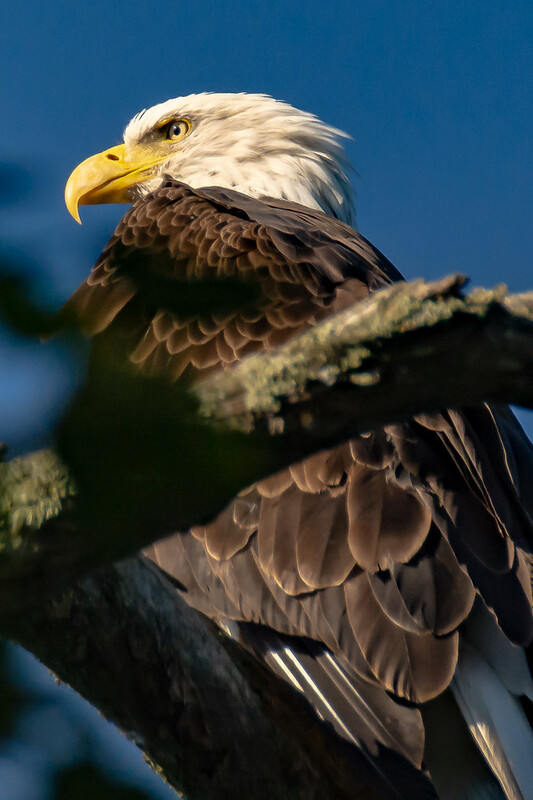 The Bald Eagle, our national emblem, is an easily recognizable and spectacular bird. It has a dark brown body and wings and a white head and tail. Its legs and feet are bright yellow, as is its large, hooked bill. Its piercing eyes are light yellow. Females are larger than males, weigh from 10-14 pounds, and have a 6½- to 7-foot wingspan. Males usually weigh from 8-10 pounds and have a 6- to 6½-foot wingspan. Juveniles (one-year old birds) and sub-adults (birds up to four years of age) are brown, with varying degrees of white mottling below. Young eagles do not reach full adult plumage until they are 4-6 years old. Bald Eagles may live up to 40 years. During the winter the Bald Eagle can be found along the Mississippi River in Missouri and during the summer you find them in Vilas and Onida Counties in Northern Wisconsin. This bird was photographed on the grounds of The Point Hotel & Resort on Lake Minocqua. There are so many of these birds in this area that 172 nests have been counted in Vilas County and 154 nests in Onida County. This may be the best place in the country to see the magnificent birds.